MAG Creek Wellbeing Resort ... first of its kind in the region. 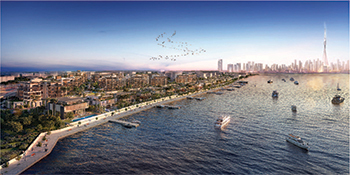 MAG Lifestyle Development, the development arm of MAG Group, has appointed Dar Alwd Contracting as the infrastructure contractor for MAG Creek Wellbeing Resort, the first wellness-inspired development in the Middle East. Under the management of lead consultant VX and architects A++, construction is well under way and the Dh2.2-billion ($599 million) development is on track for the expected delivery date, with 26 per cent of the work already accomplished. Phase One of the project will be completed in August next year and the entire project will be ready by June 2020. Infrastructure works at the project are now complete and the next construction phase includes backfilling, compacting, trench excavation, and laying uPVC (unplasticised polyvinyl chloride) and GRP (glass-reinforced plastic) pipes for the drainage system. Dar Alwd Contracting is also responsible for constructing the development’s manholes and chambers. Meanwhile, A++ is responsible for the project’s interiors and exteriors, including the mansions designed by renowned Italian architect Carlo Colombo. A++ and VX, together with nine other companies, are responsible for ensuring that residents enjoy seamless interactions with their surroundings, informed by research compiled by specialists in this field and taking into consideration that residents can spend up to 70 per cent of their time indoors. MAG Creek Wellbeing Resort has been designed in partnership with Delos, a leading wellness real estate and technology company, to provide residents with a holistic and healthy lifestyle by integrating the best of science, health and technology within the built environment. The gated, landscaped community spans over 898,786 sq ft and covers 550 m of the highly sought-after Dubai Creek waterfront. It is strategically situated adjacent to the Ras Al Khor Flamingo Wildlife Sanctuary and only 4.5 km away from the Burj Khalifa and Downtown Dubai.